Is that Pollen Inside my Home? Spring is a beautiful time of year even between all those sneezes! Yes, pollen can find a way to get inside your home and into your carpet or upholstery. Carpet is one of the biggest “traps” of pollen. However, there are ways to help keep your home allergy-free. Increase the frequency in which you dust and vacuum. There is no better way to help pollen-proof your home than to dust and vacuum frequently, especially in the spring when pollen levels are high. Dust and vacuum every few days, and if possible, every day. And make sure to dust everything! Not just that table in the family room. Dust areas you don’t normally think about like the ceiling fans, baseboards, and the figurines hidden in the bookcase. Apply sticky tape to pollen stain on carpets and upholstery for a ‘quick fix.’ While no method is 100% in reducing pollens, this tape trick can help rid your home of obvious pollen stains on carpet and upholstery. This will help reduce the amount of pollen on these areas until you have them professionally cleaned and Chem-Dry can apply an anti-allergen on the carpets and upholstery. 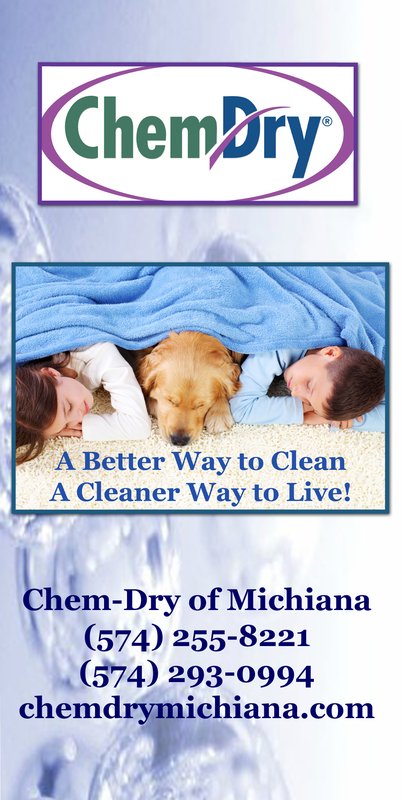 If you need more information on our anti-allergen product, give Chem-Dry of Michina a call. And enjoy the weather out there. This entry was posted in Allergy Relief, Carpet Cleaning, Maintaining a Healthy Home and tagged allergy relief, allergy season, carpet cleaning. Bookmark the permalink.